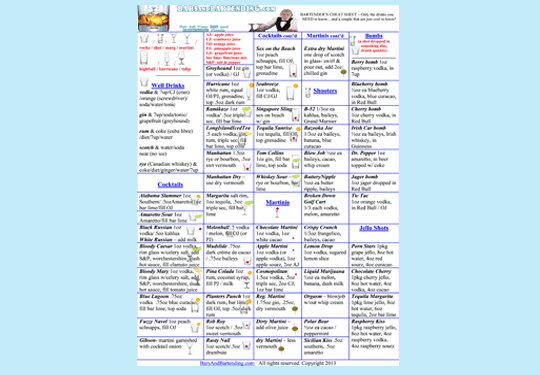 The bartender cheat sheet – many up-and-coming bartenders believe or have been told that to be a bartender, you need to know thousands and thousands of different drink recipes. This simply isn’t true. Maybe if you were trying to get into a high-end martini or cocktail lounge in London, New York or Paris. But if we’re talking about your average bartender…. This free bartending cheat sheet contains 95% of the drink recipes you’ll ever need to know. The other 5% that you’ll need to learn are the specialties that differ from pub to club, town to city and country to country. 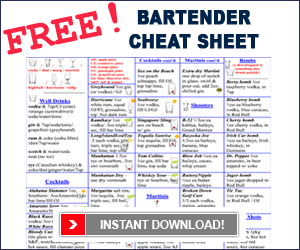 To get your hands on your free printable bartenders cheat sheet, simply enter your name and email address above and you’ll be sent a link where you can download your free bartenders cheat sheet. A bartender cheat sheet is the easiest way for up and coming bartenders to get to know the most important drinks of their trade as well as for current bartenders to be able to remember some of those drinks that they only have to make once in a while.